23 กันยายน 63 ปีก่อน ค.ศ. ↑ Jo-Ann Shelton, As the Romans Did (Oxford University Press, 1998), 58. Bivar, A.D.H. (1983). "The Political History of Iran Under the Arsacids," in The Cambridge History of Iran (Vol 3:1), 21–99. Edited by Ehsan Yarshater. London, New York, New Rochelle, Melbourne, and Sydney: Cambridge University Press. ISBN 0-521-20092-X. Blackburn, Bonnie & Holford-Strevens, Leofranc. (1999). The Oxford Companion to the Year. Oxford University Press. Reprinted with corrections 2003. Bourne, Ella. "Augustus as a Letter-Writer," Transactions and Proceedings of the American Philological Association (Volume 49, 1918): 53–66. Brosius, Maria. (2006). The Persians: An Introduction. London & New York: Routledge. ISBN 0-415-32089-5 (hbk). Dio, Cassius. (1987) The Roman History: The Reign of Augustus. Translated by Ian Scott-Kilvert. London: Penguin Books. ISBN 0-14-044448-3. Eck, Werner; translated by Deborah Lucas Schneider; new material by Sarolta A. Takács. (2003) The Age of Augustus. Oxford: Blackwell Publishing (hardcover, ISBN 0-631-22957-4; paperback, ISBN 0-631-22958-2). Eder, Walter. (2005). "Augustus and the Power of Tradition," in The Cambridge Companion to the Age of Augustus (Cambridge Companions to the Ancient World), ed. Karl Galinsky, 13–32. Cambridge, MA; New York: Cambridge University Press (hardcover, ISBN 0-521-80796-4; paperback, ISBN 0-521-00393-8). Everitt, Anthony (2006) Augustus: The Life of Rome's First Emperor. Random House Books. ISBN 1400061288. Green, Peter (1990). Alexander to Actium: The Historical Evolution of the Hellenistic Age. Hellenistic Culture and Society. Berkeley, CA; Los Angeles; London: University of California Press. ISBN 0-520-05611-6 (hbk. ); ISBN 0-520-08349-0 (pbk.) Check |isbn= value: invalid character (help). Gruen, Erich S. (2005). "Augustus and the Making of the Principate," in The Cambridge Companion to the Age of Augustus (Cambridge Companions to the Ancient World), ed. Karl Galinsky, 33–51. Cambridge, MA; New York: Cambridge University Press (hardcover, ISBN 0-521-80796-4; paperback, ISBN 0-521-00393-8). Kelsall, Malcolm. "Augustus and Pope," The Huntington Library Quarterly (Volume 39, Number 2, 1976): 117–131. Mackay, Christopher S. (2004). Ancient Rome: A Military and Political History. Cambridge University Press. ISBN 0521809185. Scullard, H. H. (1982) . From the Gracchi to Nero: A History of Rome from 133 B.C. to A.D. 68 (5th ed.). London; New York: Routledge. ISBN 0415025273. Shaw-Smith, R. "A Letter from Augustus to Tiberius," Greece & Rome (Volume 18, Number 2, 1971): 213–214. Shotter, D.C.A. "Tiberius and the Spirit of Augustus," Greece & Rome (Volume 13, Number 2, 1966): 207–212. Southern, Pat. (1998). 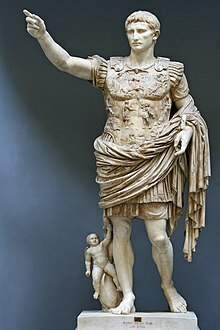 Augustus. London: Routledge. ISBN 0-415-16631-4. Starr, Chester G., Jr. "The Perfect Democracy of the Roman Empire," The American Historical Review (Volume 58, Number 1, 1952): 1–16. Syme, Ronald (1939). The Roman Revolution. Oxford: Oxford University Press. ISBN 0-19-280320-4 (pbk.) Check |isbn= value: invalid character (help). หน้านี้แก้ไขล่าสุดเมื่อวันที่ 6 มกราคม 2562 เวลา 20:32 น.